A According to archaeological evidence, at least 5, 000 years ago, and long before the advent of the Roman Empire, the Babylonians began to measure time， introducing calendars to co-ordinate communal activities, to plan the shipment of goods and, in particular, to regulate planting and harvesting. They based their calendars on three natural cycles: the solar day, marked by the successive periods of light and darkness as the earth rotates on its axis; the lunar month, following the phases of the moon as it orbits the earth; and the solar year, defined by the changing seasons that accompany our planet's revolution around the sun. B Before the invention of artificial light, the moon had greater social impact. And, for those living near the equator in particular, its waxing and waning was more conspicuous than the passing of the seasons. Hence, the calendars that were developed at the lower latitudes were influenced more by the lunar cycle than by the solar year. In more northern climes, however, where seasonal agriculture was practiced, the solar year became more crucial. As the Roman Empire expanded northward, it organised its activity chart for the most part around the solar year. C Centuries before the Roman Empire, the Egyptians had formulated a municipal calendar having 12 months of 30 days, with five days added to approximate the solar year. Each period of ten days was marked by the appearance of special groups of stars called decans. At the rise of the star Sirius just before sunrise, which occurred around the all-important annual flooding of the Nile, 12 decans could be seen spanning the heavens. The cosmic significance the Egyptians placed in the 12 decans led them to develop a system in which each interval of darkness （and later，each interval of daylight） was divided into a dozen equal parts. These periods became known as temporal hours because their duration varied according to the changing length of days and nights with the passing of the seasons. Summer hours were long, winter ones short; only at the spring and autumn equinoxes were the hours of daylight and darkness equal. Temporal hours, which were first adopted by the Greeks and then the Romans, who disseminated them through Europe, remained in use for more than 2, 500 years. D In order to track temporal hours during the day, inventors created sundials， which indicate time by the length or direction of the sun's shadow. The sundial's counterpart, the water clock, was designed to measure temporal hours at night. One of the first water clocks was a basin with a small hole near the bottom through which the water dripped out. The falling water level denoted the passing hour as it dipped below hour lines inscribed on the inner surface. Although these devices performed satisfactorily around the Mediterranean, they could not always be depended on in the cloudy and often freezing weather of northern Europe. E The advent of the mechanical clock meant that although it could be adjusted to maintain temporal hours, it was naturally suited to keeping equal ones. With these， however, arose the question of when to begin counting, and so, in the early 14th century, a number of systems evolved. The schemes that divided the day into 24 equal parts varied according to the start of the count: Italian hours began at sunset， Babylonian hours at sunrise, astronomical hours at midday and 'great clock' hours， used for some large public clocks in Germany, at midnight. Eventually these were superseded by 'small clock', or French, hours, which split the day into two 12-hour periods commencing at midnight. F The earliest recorded weight-driven mechanical clock was built in 1283 in Bedfordshire in England. The revolutionary aspect of this new timekeeper was neither the descending weight that provided its motive force nor the gear wheels （which had been around for at least 1, 300 years） that transferred the power； it was the part called the escapement. In the early 1400s came the invention of the coiled spring or fusee which maintained constant force to the gear wheels of the timekeeper despite the changing tension of its mainspring. By the 16th century, a pendulum clock had been devised, but the pendulum swung in a large arc and thus was not very efficient. 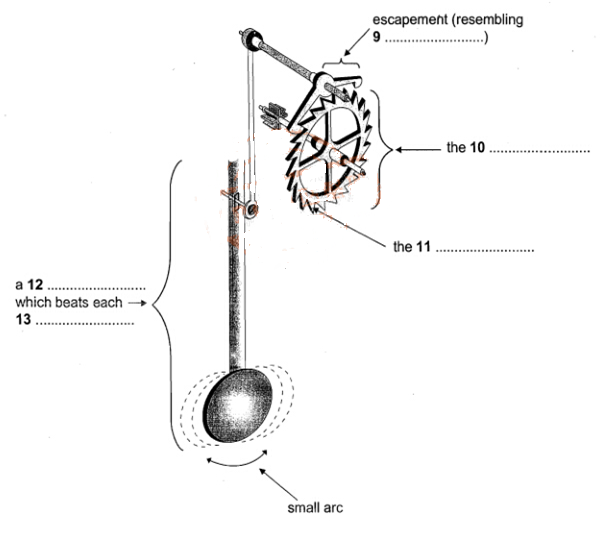 G To address this, a variation on the original escapement was invented in 1670， in England. It was called the anchor escapement, which was a lever-based device shaped like a ship's anchor. The motion of a pendulum rocks this device so that it catches and then releases each tooth of the escape wheel, in turn allowing it to turn a precise amount. Unlike the original form used in early pendulum clocks， the anchor escapement permitted the pendulum to travel in a very small arc. Moreover, this invention allowed the use of a long pendulum which could beat once a second and thus led to the development of a new floor-standing case design, which became known as the grandfather clock. H Today, highly accurate timekeeping instruments set the beat for most electronic devices. Nearly all computers contain a quartz-crystal clock to regulate their operation. Moreover, not only do time signals beamed down from Global Positioning System satellites calibrate the functions of precision navigation equipment, they do so as well for mobile phones, instant stock-trading systems and nationwide power-distribution grids. So integral have these time-based technologies become to day-to-day existence that our dependency on them is recognised only when they fail to work. Look at the following events (Questions 5-8) and the list of nationalities below. Match each event with the correct nationality,A-F. Drag the correct letter,A-F, into boxes 5-8 on your answer sheet.